The city has a rich history and recently intensified it’s efforts to promote this attribute on both a state and national level. Due to it’s connections with several historical figures and structures, a historic district was created and placed on the National Register of Historic Places. There are many historic landmarks within the city limits, the most notable of which is the Pike County Courthouse. 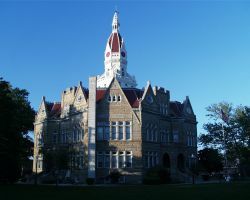 Located in Pittsfield, it was built in 1894 by Robert Franklin, a master mason who designed and supervised the keystone architecture of this courthouse. It is the third courthouse in the town, but the fourth in Pike County. The courthouse is fashioned of Cleveland sandstone. The building is octagonal in shape, with overall dimensions of 110 feet by 119 feet with center dome reaching a height of 136 feet. Abraham Lincoln practiced law in Pittsfield, but not in this courthouse. He worked on 34 cases between 1839 and 1852. The historic courthouse is one of the most popular landmarks frequently photographed by tourists. Abraham Lincoln and Stephen A. Douglas, spoke in this courtyard during the senatorial campaign of 1858. Lincoln’s private secretaries that accompanied him to the White House were from Pittsfield. John Hay, author of Pike County Ballads, diplomat and Secretary of State 1898-1905, received his academic education in Pittsfield and John G. Nicolay, edited the Whig Free Press which was published in Pittsfield prior to the Civil War.